Everyone loves pasta in my family and my son especially adores pasta. He can eat pasta in any form or in any shape. When he started going to daycare, it was a nightmare for me every night as to what I should cook for him for lunch . My great option by then was Pasta that is not only nutritious but can be eaten cold too and the Lunch box came empty if and only if it was pasta. Since then at any time, there would be atleast ten differnt kinds of pasta in my pantry. Until he was seven years old, he always preferred Pasta either with Alfredo Sauce or with Chedder Cheese. I boil the Pasta according to the Package Instructions and mix with any of these two sauces (only the Raghu Brand). As easy it is! Nowadays, I usually make pasta with Vegetables and sauces, hoping he will get some veggies. I make either baked or pan sauteed pasta. Once served, he gobbles up all the pastas leaving the vegetables blinking behind on the plate sadly. I am working hard on making him to eat veggies. The one I am going to write is very easy pasta recipe with Vegetables. 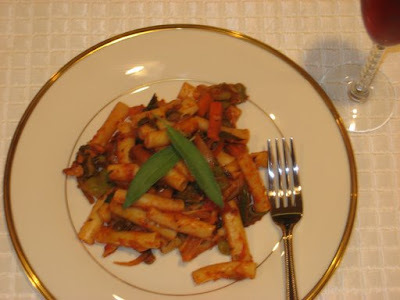 You can use any kind of tubular pasta (Penne, Tubini, Rigatoni..) for this recipe. Boil the Pasta according to the Package Instructions. Once you drain the Pasta in the colendar , give the pasta a nice toss with a tablespoon of olive oil . This prevents the the pasta from drying. Heat oil in a large nonstick skillet over medium heat. Sautee chopped garlic for a minute. Add the vegetables. Cook the vegetables until it begins to soften. Add the Pasta Sauce and the Chilli flakes and mix it well with the vegetables. Add the cooked pasta to the skillet and stir it gently . Finally add the Shredded Mozzarralla Cheese to it and mix it well till the cheese melts. Season with grated Parmigiano-Reggiano cheese and fresh Sage leaves . Serve Pasta for adults with a glass of Pinot Noir (In wine there is health (In vino sanitas)-Roman Quote) and voilà!— An exquisite dinner is ready to be served. P.s. I faked the wine glass with Cranberry Juice for the photo shoot. Hehee! According to the American Heart Association (AHA), A daily glass of light cranberry juice cocktail promotes healthy blood flow and protects the heart-with fewer calories than red wine-and is a delicious option the whole family can enjoy.